A modest team at Broadway again today, with half the gang at Winchcombe continuing with chairing up. Early morning reports say they were doing very well, we should be over two thirds home now. First thing at Broadway was to find an odd length of rail, about 50ft long, to cut in half and to use the two halves to equip the Malvern side track up to the end of the barrow crossing. I wonder if this rail would do? Stevie checks the wear on it with the replacement gauge, the original having vanished from inside the Landie. Mysterious. Next we dragged the rail up to the northern end of the platforms, where it was cut in half. Lots of white bags of clips are scattered about, we have quite a bit of rail to lay and clip up here. One of the halves was then lifted in, followed by the other here. A 25ft length is much easier to get in than a standard 60ft one, so Steve was able to just drop it in in one go. We're looking at the site of the barrow crossing here, on top of the Jarrah sleepers with the shallow Pan 11 base plates. Over to you then, Bert Ferrule, to cut off the odd lengths of the 4 rails. Everyone else has retreated off camera, although there are in fact just the 6 of us up here today to lay the track. It's a small team, lots to do still. In this shot you can see Bert cutting off the last length, so that all ends beyond the barrow crossing are level with each other. From here on we continue with bullhead rail. The rail drill is already positioned to cut the holes for the fishplates on the newly cut ends. Then it was time to start laying the first lengths of bullhead, in between the platforms. We will start with the up platform, where second hand rail will be used. Steve has brought up a load of the sleepers chaired up at Winchcombe, and has paused for a chat with Bert. How are we going to do this then? The two S/H bullhead rails Steve had in tow from Childswickham are positioned in the 6 foot, and the method chosen to place the chaired up Jarrah sleepers was - manual. Argh !!! They are so heavy. Steve offers them up in fours on the wobbly forks and we then push them off either with bars, or as here with the nips. In the end the bars were friendlier on the back. Two bits of wood cut to length are used as spacers, after some headscratching as to the length of this space. We are using a slightly lower number of sleepers per length through the platform (24 instead of 26) as an economy measure, and so we can't use the white wooden spacer bars you may have seen during concrete sleeper laying sessions. When we got to the 24th sleeper, we just checked how long that was (measure twice.....) and it was just right. Well done Bert, and his mobile phone calculator. Then we had a pow-wow about lifting in the rails - the space between the platforms is cramped, and takes certain freedoms away that you had, e.g. turning a rail round that is worn on the wrong side. 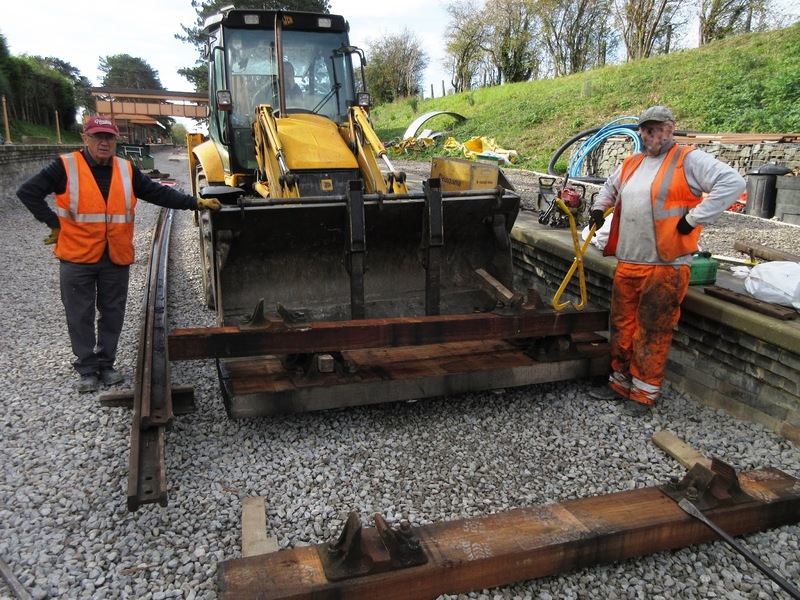 Here's the view at lunch time, with the two barrow crossing rails in and cut to size, and the first sleepers for the first bullhead length laid out and straightened, ready for rail to be dropped in. The sun then came out, which made everything a bit friendlier, although a threatening sky remained in the background. In principle, when it's over there we've already had it. Broadway gang members had a grandstand view up on the platform they built, and often came and stared at us. After spending some time on cutting rails for the barrow crossing, and getting the first length in, things went a bit faster and Steve plied us liberally with shuttles of sleepers to lay. We were soon past the first of the 8 catch pits, but of course this is double track, so we need to come back and lay the other side as well. That will be in new rail. Here's the second pair of rails going in. It's after lunch now, we've had Mrs. B's cakes, are things a bit more sluggish now? Two full panels laid now, looking quite good, don't you agree? They need keying up still, that could be for the Wednesday gang again. The unsung hero of the day was Leigh again, who really gets his teeth into fitting the fishplates. This means drilling the holes often as not, and then working out what he needs. The choice of fishplates is surprisingly large, and he also had to remove some fitted earlier to be replaced with better examples. Once he's located the correct model, it is hammered home with the impact wrench as seen here. At the end of the day we had laid two panels of rails, fitted the two short rails for the crossing, sawn it all to size, and laid out another 24 sleepers for the next bullhead rail. Wew are now clearly well into the platforms. Broadway is such a good place for an evening shot. Here's a moody overview, which shows precisely how far we got today. Next week we will be ballasting again between the platforms, and remodeling some of the embankment by the station road bridge. There's always something to do. Thanks for the update, Jo. Is it the intention to concentrate on Broadway for the moment? When will you have to start the winter maintenance tasks elsewhere on the line? I can foresee a lot of working in cold, wind, rain, sleet and maybe snow ahead! If I recall correctly, there is a programme scheduled for the non-running months after the Santa specials. Congratulations on getting track in between the platforms. I notice that some of those yellow ferrules have put in an appearance and seem to recall someone saying that the NYMR use a less "sudden" variety next to platforms. I imagine its a bit too late to do anything similar? Probably nit picking !! I think it looks wonderful as it is. The GWR probably had sleepers looking just the same as this when they used new ones on their loops and, well;..... spot re-sleepering is another tale altogether!!! Great progress was made today and I for one appreciate the work involved by the P Way team and heartily congratulate them on their efforts. Regards, Paul. Thanks for another great report and pictures Jo, can't wait to see the station in the flesh, all getting very exciting at Broadway.